The term Bokeh comes from the Japanese word meaning blur. In general, bokeh is a picture where the main object looks sharp, while other objects, the background or foreground, becomes blur. But not as simple as it is to make a bokeh effect. You can use the camera with a particular technique, for the professional cameraman, the effect of it regarded easy. But you can outsmart by using software (photoshop or corel). 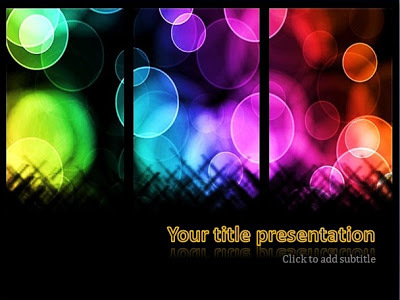 The trick was applied in making this powerpoint template backgrounds. With black as the dominant color, this template will be suitable for various themes of your presentation. There are 2 different backgrounds, namely for the title slide and text slides.